Some people claim that growing marijuana is hard, we are here to assist you with our cannabis growing help article. To ensure that growing goes by smoothly, you must do your homework and prepare for such an endeavor. Anyone can do it with the right patience, hard work and dedication. Each crop takes about 8 to 10 weeks in order to reach maturity, which is harvest time. Depending on the size of said crop, you may spend up to an hour each day tending to and caring for your plants in order to produce a potent yield. There are a few factors you should consider when choosing to grow your crop. There are multiple growing methods that you can engage in when growing marijuana. Some of the popular hydroponic methods include ebb and flood, peat and perlite, the nutrient flow technique, and aeroponics. Each of these techniques include different advantages and disadvantages. The best way to determine which technique works for you is to do your research on each method. Did you know that your plants require specific nutrient solutions in order to yield a crop that is as healthy and potent as it can be? The secret is to assemble a primary mix that feeds a plant’s overall nutritional needs, then create a secondary tailored made mixture for the three growth cycles. NPK fertilizers are the appropriate choice when selecting a healthy nutrient base for your plants. NPK stands for Nitrogen (N), Phosphorous (P), and Potassium (K), chemical elements necessary to feed plants in the growth process. If you remember anything from your high school chemistry class, it should be pH and PPM. If not, here’s a refresher. The pH level determines how acidic or alkaline material is according to a numeric scale. This is important to be aware of, because your marijuana plant prefers a slightly acidic environment, hovering around a level of 5.5. PPM stands for parts per million, referring to the overall potency of the nutrient solution within your plant soil. You can easily discover the recommended parts per million by accessing the container within which the nutrient mixture came and is referred to on its label. 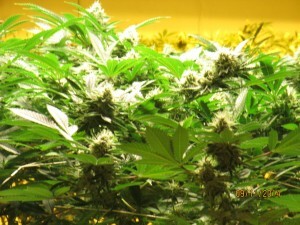 When choosing a location to grow your plant, make certain you do so in a pest, dust, and mold free environment. You will need a minimum of 6 feet of clearance and four square feet around your plant. You must make sure there is space between the top of your vertically growing plant and your lamp because you do not want the tips getting singed. Just like any leafy green plant, marijuana plants grow out. Leaves need to photosynthesize light in order to grow healthy and vigorous. If you over crowd your plants and set them too close together, they will create a mini canopy, blocking essential life-giving light from reaching some lower limbs. This could lead to an unhealthy and underdeveloped crop. Plants raised indoors need as much light as possible to grow to be big and strong. Unfortunately, window light isn’t enough to sustain, so we must substitute the sun with high powered lamps. Take into consideration how much power your outlets are limited to and how many watts you require. Generally speaking, a 1000 watt lamp is the industry norm for growing hydroponically. Residential power outlets are usually limited to 1500 watts. They will blow if anything higher than this is plugged in and pulling from the circuit. It is fairly easy to exceed this limit during the growing procedure. Thus it is crucial for a responsible grower to investigate what your power requirements are and to what the capacity is limited. As we are all aware, processed marijuana has its own distinct array of potent flavors and aromas. The plant itself is no different, especially in the budding stage. A simple way to fight this obnoxious smell, provide fresh air for your plant, and moderate room temperature is to install a HEPA filter on a vented fan. If the venting fan is positioned to expel grow room air outside, odor strength will be greatly reduced. Choosing which is the best strain to buy and grow can seem like a complicated test. The wisest thing you can do is find one that matches your level of experience and level of commitment. Factors to consider are how long it will take to become full grown, how easily that strain is grown, and the potency of your desired final product. Check out books on growing, articles, podcasts and online forums to hear what growers are saying today about current and traditional varieties of weed. Processing your plant is the last step in your grow operation. Once you’ve poured your sweat and tears into raising beautiful, mature plants, it is time to strip it of its buds! Once the buds are properly removed, they must be dried and cured. Drying and curing your buds make them safe for smoking. You can also choose to utilize the leaves as a base for concentrates, edibles or hash oil; it’s up to you to decide how much work you want to put in and how much product you want to get out of your plants! We hope this article on cannabis growing help was informative, Stay elevated!! This article on cannabis growing help is not intended for non legal states. Woh I your content, bookmarked!